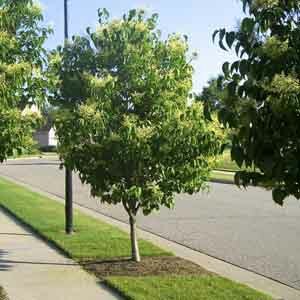 A beautiful small tree crowned with lush foliage and bejeweled with long clusters of white blooms in summer. A very hardy species that requires little pruning. Attractive, reddish brown bark adds winter interest. Sometimes grown in shrub form. A classic favorite for landscape focal points. An excellent specimen, foundation, or border plant. Outstanding for planting near walkways, decks and patios where scent can be enjoyed. Very easy to grow in virtually any location. Best in fertile, humus-rich, well-drained soil. Water freely in dry weather. Mulch annually to protect roots.